Florencia is a natural-born healer and self-empowerment artist working with heart opening therapies involving holistic nutrition, Ceremonial Grade Cacao, yoga, sound journeys, and breath work as instruments for transformation; creating a safe vessel for self exploration. She has studied sound under her Teacher Jay Emmanuel Morales– a sound healer who has been exploring sound to harmonize the body for over 30 years. 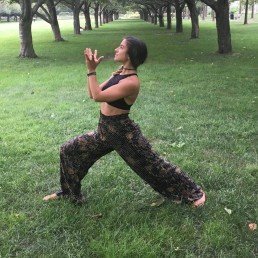 ​Florencia​ has been using the technique of Rebirthing since the age of 8 and so pranayama has been a part of her practice since a young age. She became a yoga instructor in 2013 at Laughing Lotus NYC.Florencia​’s classes have a dynamic influence of ancient practices to find a playful sense of transformation.